Thanks for a splendid evening of choral music, so musically performed. I was especially moved by “Horizons”. It’s a fine piece and I felt your performance could not have been bettered. Please congratulate your singers. They put so much into their rendering of the demanding programme and gave wonderful support throughout. I’m so full of admiration. I cannot let the day pass without extolling the virtues of the ViniChoral II evening last night. What a wonderful performance – I had the best seat in the house as I could see the choir and watch the conductor’s face. What a privilege! The choir of course also need plenty of kudos for their selfless involvement and sharing their beautiful voices. The evening was quite magical and I am delighted that it was HOUSE FULL. The wines were delicious and the pairing with chocolate a sensation I would not have believed. Many thanks to everyone for all the effort involved in presenting such an enjoyable evening. Did you miss your chance to attend ViniChoral this year? If so, drop us a line at hello@voxcapetown.com to ensure that you are at the top of the list for our next ViniChoral event. 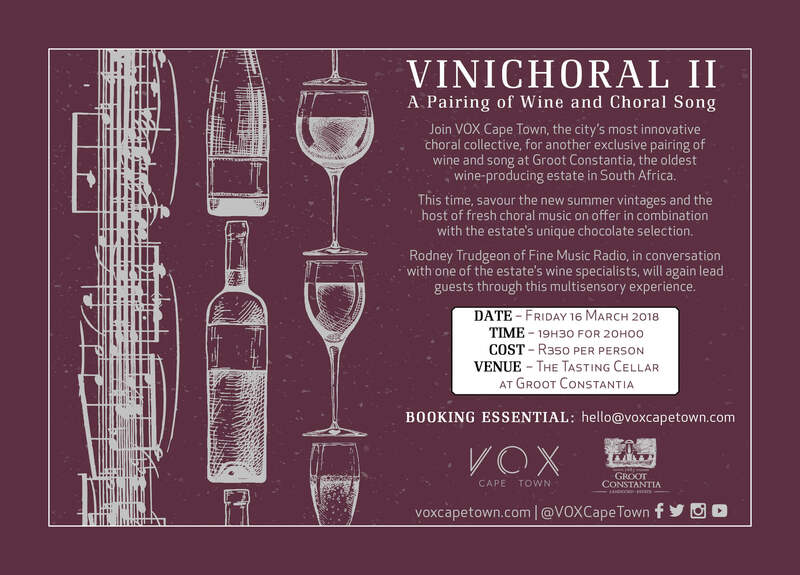 VOX Cape Town presented the second instalment of its innovative ViniChoral series – a pairing of wine and choral song – on Friday 16 March 2018. Held once again in the atmospheric Tasting Cellar at Groot Constantia, the oldest wine-producing estate in South Africa, this multisensory experience combined new summer vintages and a host of fresh choral music with the estate’s unique chocolate selection. Rodney Trudgeon of Fine Music Radio led the presentation in conversation with Karen Woodcock, one of the estate’s wine specialists, and Annelize Morkel, who has carefully designed chocolates to match each of the wines. For example, the first wine on the programme – the Groot Constantia Sauvignon Blanc 2017 – was paired with tropic guava white chocolate and three lively, humorous madrigals from the 16th century. Key words were invigorating, fresh and crisp. For the Pinotage 2016 (paired with blackberry milk chocolate), VOX presented one of South Africa’s most popular works – Peter Louis van Dijk’s “Horizons” – to match the local grape. 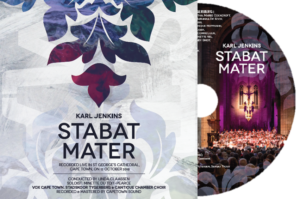 The elegance and subtlety of Sir John Tavener’s carol “The Lamb”, in contrast with its “fiery, passionate, peppery” companion composition “The Tyger”, were both paired with the complex Groot Constantia Shiraz 2015. Ending the evening off on a sweet note was the estate’s famous golden dessert wine, the Grand Constance, paired with a “sweet, warm, rich” nod to contemporary film music from The Lord of the Rings (“May it be an evening star / Shines down upon you”).